ICECOLOR 1000 is the ultimate model in the range. It has been designed for large spaces providing an overall flux in excess of 20,000 lumens, unequalled on the market. With its native 11° optics, this luminaire is ideal for long-range environments. Fitted with optional 24° to 80° holographic filters, it can also take its place in close-range applications with a wide range of variable coverage. 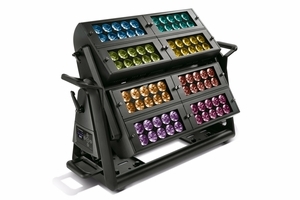 The ICECOLOR 1000 is fitted with two 40 x 10 watt RGBW LEDs modules with separate controls for the eight LED matrix. The two modules can be filtered, and the direction of each can be adjusted independently for greater flexibility of use. With an IP65 ingress protection, the ICECOLOR 1000 can be used indoors or outdoors and can be controlled remotely through its integrated wireless DMX receiver. Changing the town’s colours has never been easier. From the more saturated tones to a huge selection of pastel colours, the 4.7 billion possible combinations offer an unequalled colour palette to meet the requirements of the most demanding projects.